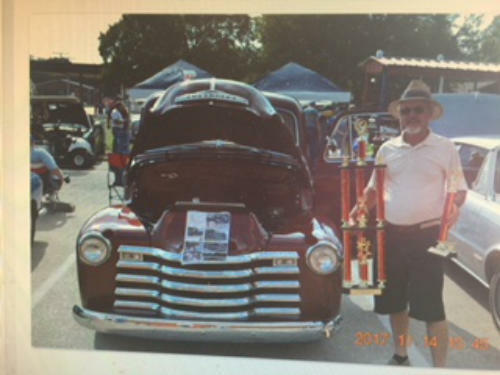 Year after year, The Texas Mushroom Festival’s Auto Showcase continues to be one of the most highly attended events. There are over 15 different classes that you can enter. Trophies are awarded for several of these classes, photos will be taken and featured on this website as well as other printed material. Please read the registration information carefully as there are benefits for early registration. You may download the entry forms below. 1. Show is open to all makes and models of vehicles, including motorcycles and off-road. 2. One form per entry. Multiple entries per owner are permitted and welcome. 3. All entries will showcase their auto on the festival grounds on October 13 from 10 am until 3 pm. You may arrive on site as early as 8:30 am but MUST stay the duration. 4. Entries will receive THEIR packet and complete instructions upon arrival. 5. The winners will be determined by People’s Choice voting. The Best Paint, Best Interior, and Best Underhood will be chosen by a panel of 5 judges and their decision is final! Sponsored trophies will be awarded, chosen by the sponsor! PRE-REGISTRATION IS ENCOURAGED!!!!! First 50 entries receive a gift basket! 1. The top Award winners (chosen by People’s Choice voting during the festival) will receive a trophy and a featured spot in the Madisonville Meteor Newspaper. 2. Judging will be on October 13 around 1:30 pm with awards presented at 3.00 pm.